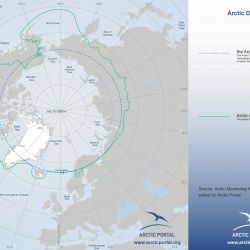 portlets.arcticportal.org - Where is the Arctic? To describe where the Arctic is, we need first to define what the Arctic is. 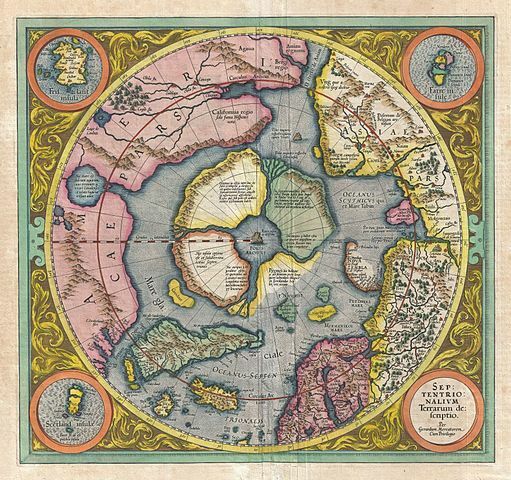 First Map of the North Pole, Mercator Hondius, Geographicus 1606 (source: wikipedia.org)Although anybody may point where the Arctic is, that is to say, that portion of sea and land surrounding the North Pole or, in more in general, that northernmost portion of the Northern hemisphere, “there is nothing intuitively obvious about the idea of treating the Arctic as a distinct region” (Arctic Human Development Report I). In fact, the definition of the Arctic has represented and yet represents an issue per se, and yet no single, clear cut boundary currently exists. Rather, the definition of Arctic very much depends on the features highlighted. The word “Arctic” derives from the ancient Greek, arktikos, literally meaning “of the Bear ”, referring to either the Ursa Major either the “Ursa Minor” constellation, in any case, an idea pointing the geographical North. 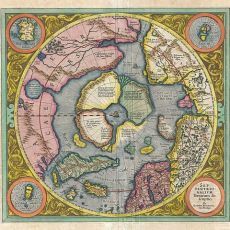 For centuries, the Arctic was vaguely considered as the northernmost lands and waters of the northern hemisphere, with no clear knowledge of it. In fact, even if the Arctic regions have been inhibited for millennia by indigenous populations (for example, the earliest known cultures in Greenland, the Saqqaq culture, is dated 2500-800 BC), Western societies had little knowledge of, and interest in, the area, until very recent times. Knowledge of the area has been a slow and progressive process started centuries ago, and yet not fully accomplished, as described for instance by the Icelandic President Ólafur Ragnar Grímsson’s famous quote “we know more about the moon than the Arctic”. In contemporary times, the Arctic region has been primarily defined as this portion of land and water above the parallel 66° 33’’ 44’’ North, that is to say, the “Arctic Circle”. This imaginary line circling the globe marks the latitude above which, in theory, the sun never sets on the summer solstice, June 21st and never rises on the Winter Solstice, December 21st. However, due to refraction and other physical effects, the “midnight sun” may be seen also at lower latitudes. Understandably, the portion of the globe described by the Arctic Circle does not follow any specific criteria, separating contiguous areas potentially homogenous. Indeed, additional biophysical and other criteria have been progressively outlined to encompass a more homogenous region surrounding the North Pole. Among these biophysical criteria still in use, is the 10° July isotherms, defined as being the area where the average temperature in the warmest month (July) is below 10ºC / 50ºF. Another criteria in use, for instance, is the tree-line. The tree line or timberline is the edge of the habitat at which trees are capable of growing. Beyond the tree line, they are unable to grow because of inappropriate environmental conditions (usually cold temperatures, insufficient air pressure, or lack of moisture). At the tree line, tree growth is often very stunted, with the last trees forming low, densely matted bushes. If it is caused by wind, it is known as krummholz formation, from the German for 'twisted wood'. The tree line, like many other natural lines (lake boundaries, for example), appears well-defined from a distance, but upon sufficiently close inspection, it is a gradual transition. Trees grow shorter towards the inhospitable climate until they simply stop growing. Extremely cold temperatures can result in freezing of the internal sap of trees. In addition, permafrost in the soil can prevent trees from getting their roots deep enough for the necessary structural support. Because the climatic zone in which the high-latitude timberline occurs is almost entirely under water in the Southern Hemisphere, this timberline exists only in the Northern Hemisphere. It crosses northern Siberia, Alaska, and Canada, and far-northern Scandinavia. The above definitions based on biophysical criteria, while defining a portion of territory with very homogenous physical characteristic, have turn out to be unsuitable in defining a region under common economic, political and social features. As the geopolitical relevance of the Arctic has been constantly growing over the last few decades, so has the interest in defining its borders. 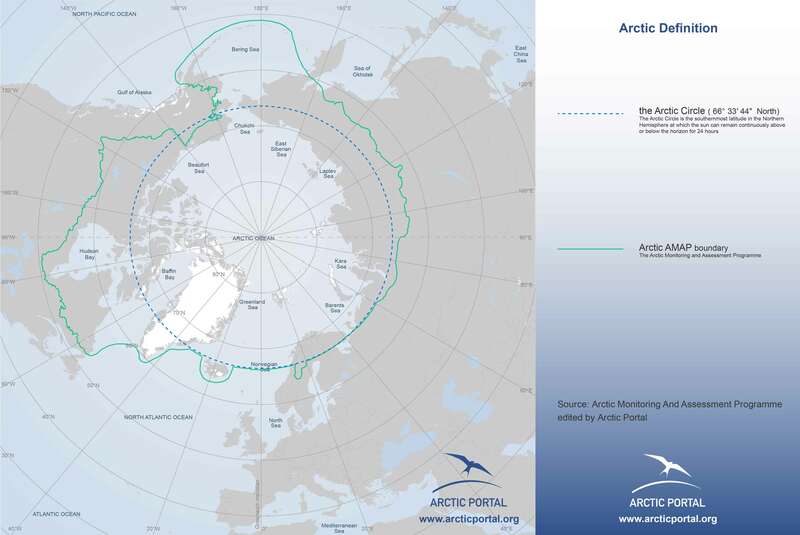 However must be bear in mind, as stated above, that “when defining Arctic regions, it is understood that no single, clear cut boundary exists to delineate their extent. Rather, this boundary will change with its application: environmental, biological, economic, jurisdictional, or social”(Grid-Arendal). 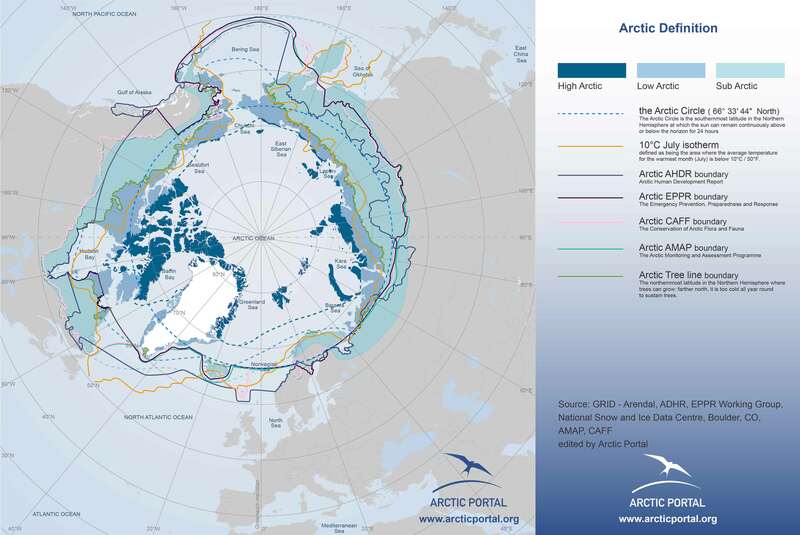 An extensive work aimed at better outlining an economically/socially/politically homogenous region to be called “Arctic” has been initiated during the late 90’s by the Arctic Council Working Groups, which were in need to define the boundaries of their mandate. In fact, although the Arctic Council counts of 8 Arctic States Members (Canada, USA, Iceland, Kingdom of Denmark, Sweden, Norway, Finland and Russia), not the whole territory of these countries can be considered as Arctic. "Given the different definitions of the Arctic, based on physical-geographical characteristics as described above, and those based on political and administrative considerations within different countries, no simple delineation of the Arctic region was applicable for the purposes of the AMAP assessment. To establish a geographical context for the AMAP assessment, therefore, a regional extent was defined based on a compromise among various definitions. This incorporates elements of the Arctic Circle, political boundaries, vegetation boundaries, permafrost limits, and major oceanographic features. The region covered by AMAP is, therefore, essentially the terrestrial and marine areas north of the Arctic Circle (66°32'N), and north of 62°N in Asia and 60°N in North America, modified to include the marine areas north of the Aleutian chain, Hudson Bay, and parts of the North Atlantic Ocean including the Labrador Sea. As stated above, the AMAP boundary was established to provide a geographical context for the assessment, in particular source-related assessment issues, i.e., consideration of sources within and outside the Arctic. The relevance of the AMAP boundary varies when considering different issues, and it has therefore been applied accordingly. Thus, contaminant levels in biota are addressed in relation to the geographical occurrence of the species concerned; demographic data are discussed in relation to administrative regions on which, for example, census data are collected. The Arctic boundaries as defined by AMAP have been the ground for several following well-known definitions, as for instance the Arctic Human Development Report I and II, one of the most used definition nowadays: “For this reason, the AHDR takes as its point of departure the region that the Arctic Monitoring and Assessment Programme covers in its 1997 and 2002 reports (4-5). 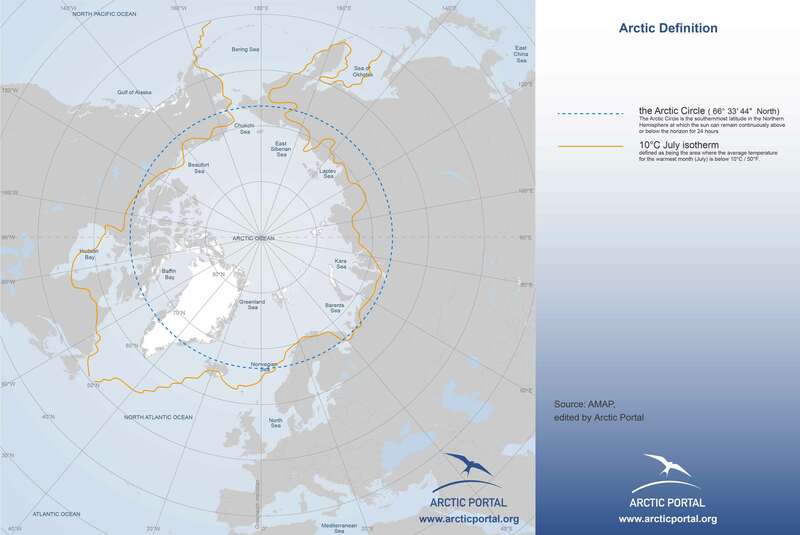 For reasons having to do mainly with the location of jurisdictional or administrative boundaries and the availability of data, however, the area covered by this report differs from the AMAP Arctic in some respects”. the, a Murmansk Oblast, the Nenets, YamaloNenets, Taimyr, and Chukotka autonomus okrugs, Vorkuta City in the Komi Republic, Norilsk and Igsrka in Krasnoyarsky Kray, and those parts of the Sakha Republic whose boundaries lie closest to the Arctic Circle”. Other, as the Conservation of Arctic Flora and Fauna (CAFF), another AC Working Group, has developed their own boundaries, which are defined as much by political boundaries as by climatic and biological zoning, and“ largely follows the treeline in order to include the ecosystems that are the focus of its activities”(Although the Arctic Biodiversity Reports follows “a more scientific definition of the Arctic”, that is to say, the Circumpolar Arctic Vegetation Map’s (CAVM Team 2003) definition of the Arctic). This brief overview has shown that, although generally understood as the region around the North Pole consisting of a large Ocean surrounded by land, there is no universal definition of the Arctic. 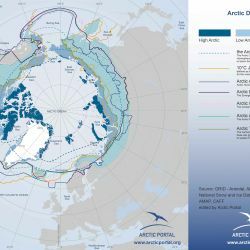 Depending on the criteria in use, large areas of the Northern hemisphere may be or may be not described as "Arctic".. As accurately described by Grid-Arendal, "when defining Arctic regions, it is understood that no single, clear cut boundary exists to delineate their extent. Rather, this boundary will change with its application: environmental, biological, economic, jurisdictional, or social”(Grid-Arendal).